Breaking News: WBAW? is on the move! 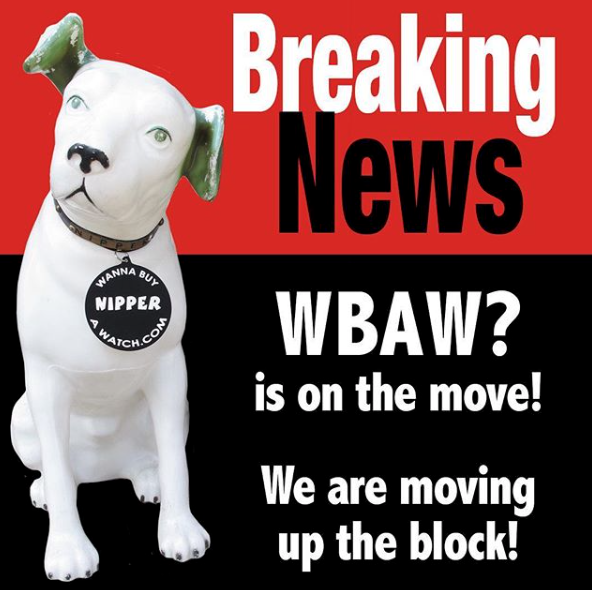 Home > Events > Breaking News: WBAW? is on the move! Wanna Buy a Watch? has been a bit quiet about this, because they are kind of sad that they need to leave their current location of 13 years which we, and we think most of you, quite love. Their last day at their current location is this Thursday, September 20th. They are then closed until Tuesday, Oct 2nd when they open at their new location 8441 Melrose just 7 doors East on the same side of the street. All their other contact information remains unchanged. There will be no repair drop offs or pickups during their 7 days closed, and their merchandise will not be accessible during this period. In the event of an emergency, please call the store at 323 653-0467 or email them at sales@wannabuyawatch.com and they will do their best to assist you. On line sales will continue during this period, but no shipping until they reopen Tuesday Oct 2. They apologize for the short notice and for any inconvenience this may cause any of you, but they will soon opening at their new location that we think you will love!